Michael Barnes began working with clay in 1989. The material captured his heart and mind, inspiring him to leave his job and pursue a career as a ceramic artist. Mr. Barnes earned degrees in Art and Geology from Southern Illinois University in the 1970's. He has worked professionally as both a construction engineer and an exploration geophysicist. Claymaker Ceramics, his business and studio name, was formed in 1994 and is located in a renovated firehouse in Big Rock, Illinois, a small farming community about 60 miles west of Chicago. In this peaceful setting he creates and fires his work. 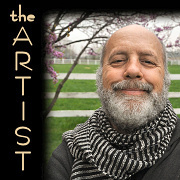 Mr. Barnes displays and sells his work nationwide at various art shows (see schedule). His work can also be viewed at his studio in Big Rock by appointment only. "The heads, faces, and figures I create are imaginary beings...The pieces are not race or culture specific. They are more like composites of real, fictional, and dreamed people...pushed, shaped, and fired for life in a vitrified world. The work is a response, both conscious and other, to the inputs I have received from life, filtered through my being, and transformed from thoughts to physical efforts, to a finished ceramic piece. Inevitably, the work reflects the viewer's inner self and progresses beyond my scope."